YTView is a social media promotions company that claims to provide affordable YouTube views services for thousands of clients. Their YouTube view packages range from 1000 to 1 million views. They claim to have provided services to thousands of clients. We took a closer at the company and we were not impressed with what they offer. The low prices listed on their site seem to be only for show, as they provide very little information on the kind of views they deliver. This raises a lot of questions about their overall service. That perception is not helped by their low-quality website. The provider also lacks the extensive customer support and protections seen in higher-end providers. You can only reach them through email and they do not respond often to questions. The only guarantee that you get is a money-back guarantee, which comes with very little information on how to claim it. Overall, we do not recommend this provider for YouTube views. You would have a better chance finding good quality service and prices by checking out our top YouTube views providers we have reviewed. 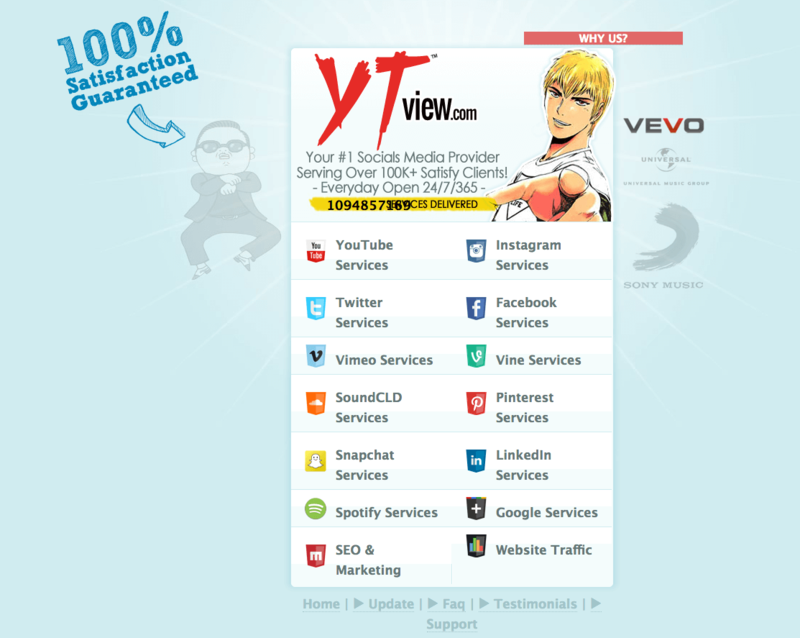 YTView is a website providing a variety of social media promotions services. They claim to have been established in 2012. The company’s site is sparsely designed, featuring a simple listing of the services they offer. They provide YouTube views, as well as likes, dislikes, shares, subscribers, and comments. The company has similar services for Twitter, Instagram, Facebook, and SoundCloud, among others. The site also claims to have 24/7 customer support. YTView offers several YouTube views plans ranging from 1,000 to 1 million views. According to their site, these views have a minimum turnaround time of three to seven days. The results will begin to show in your video within one to three days. The site accepts Paypal and credit cards as modes of payment. To order, simply provide the URL of the video you want to send the views to. YTView does not provide a dedicated Terms of Service page on their site. Instead, you will be able to find a handful of policy mentions in their FAQ section. These policy mentions are very short and do not provide any useful or detailed information. The site says all of the views they deliver come from real people and are sourced worldwide. They also state that you will not get banned from using their services. There is very little on-site information to back up these claims. According to YTView, they do not sell or share your information with other parties. The site adds that your transactions are kept secure and are not shared with others. 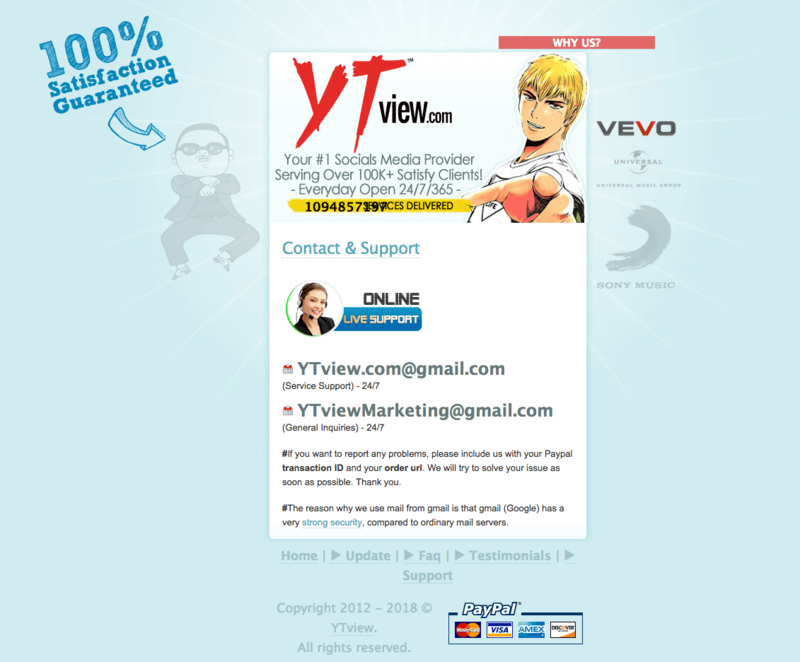 YTView claims to provide a 100% money-back guarantee if they fail to deliver the views that you order. The site has no additional information on how the refunds work or how you can claim them. YTView does not have any form of retention or replacement guarantees for dropped views. ustomer Support YTView only provides customer support through email. They have separate email addresses for service support at YTview.com@gmail.com, and one for product inquiries at YTviewMarketing@gmail.com. Their response time is very slow and not useful when dealing with urgent issues. YTView may offer low prices for their YouTube Views service, but the quality of views they deliver provides very little value. The lack of proper customer support further lessens their appeal. As such, we don’t recommend using any of their services. You should take a look at our list of top providers to find ones that offer better deals and prices. YTView claims that the views they provide come from real people around the world. They did not include additional information, however, about the quality of these views or their methods of getting them, making them dubious. There is no information on YTView’s site about the overall watch and retention rates of the YouTube views that they provide. YTView boasts some of the lowest prices we have seen for YouTube Views plans, but you get very little value for these prices. While they claim to provide views from real people, there is barely any information on their site to support this claim. The site’s lack of proper security features is also a big concern for us. Additionally, the company fails when it comes to customer support and protection. They can only be reached through email and their response time is very slow. This is made worse by their lack of sufficient service guarantees. Overall, we suggest that you avoid them completely. You can find better services and offers by checking out our list of the best providers available.